2011 Best Picture Academy Award winner The King’s Speech arrived on DVD and Blu-ray on April 19, 2011, from The Weinstein Company and Anchor Bay Entertainment. 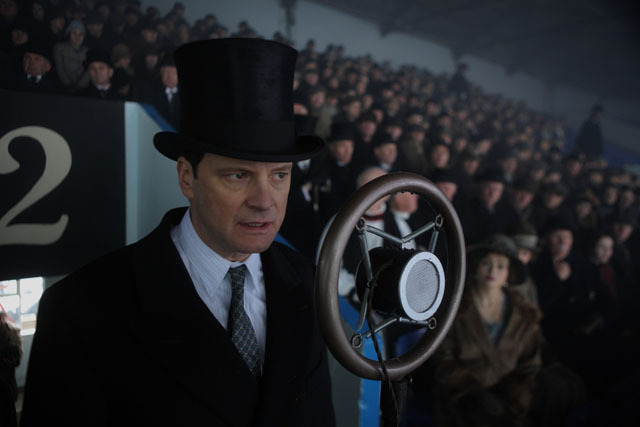 Rated R, the biography drama stars Colin Firth (A Single Man, and winner of the Golden Globe for best actor in a drama) as King George VI, a stutterer who ascends to the throne suddenly when his brother abdicates. With the support of his wife (Helena Bonham Carter, Alice in Wonderland), King George engages an unorthodox speech therapist (Geoffrey Rush, Pirates of the Caribbean movies), who helps the king find his voice so he can lead the country through war. Starting out in a limited release in theaters, The King’s Speech eventually went wide and has grossed $138.8 million. As well as Best Picture, the movie won Oscar statues for Best Actor for Firth, Best Director and Best Original Screenplay and was nominated in eight other categories. Although it wasn’t as big a winner in the Golden Globes, the film was nominated for seven honors and won Best Actor for Firth. The DVD was priced at $29.98 and Blu-ray at $39.99. archival footage of the real King George VI.